I am hoping... naptime is easier and on-time today. Nathaniel did not nap until 6:15ish last night. He was fine but I can tell he was exhausted. We fully expected him to fall asleep in his high chair during dinner. I am hearing... Silence :) Mornings are definitely "me" time. Around the house... a new 12-cup food processor! I finally used the gift card my in-laws gave me last Christmas. One of my favorite things... my still relatively new iPhone 4! Inspired by the church song... Holy Ground; We have sang this song in Church for weeks in a row now and although I am ready to not sing it for a while (I know that sounds horrible! ), it really has a great meaning. A perfect and holy God. With hearts made clean by Jesus' blood. And I know there are angels all around. Let us praise Jesus now;"
We are standing in His presence on holy ground." 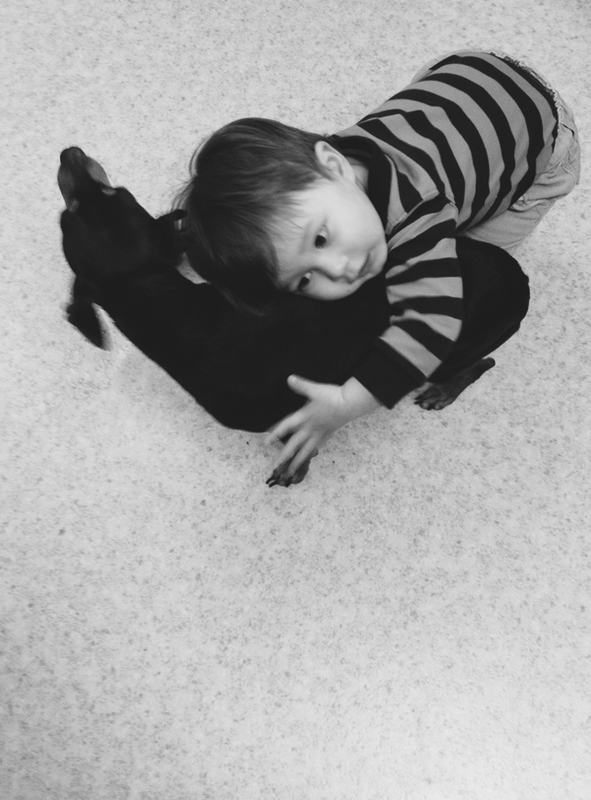 Here is a picture I am sharing... 3.20.11 Nathaniel loves his puppy VERY much and often gives her hugs and kisses. I think you mean he loves MY puppy! Hope your Husband has a wonderful Birthday...beautiful picture...I love that song.